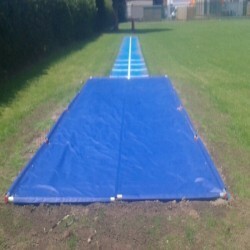 Athletics tracks and long jump surfaces are very popular at schools, universities and sports clubs. It's important to have these surfaces installed to the highest standards so that children are able to improve their skills and take part in a variety of sports. 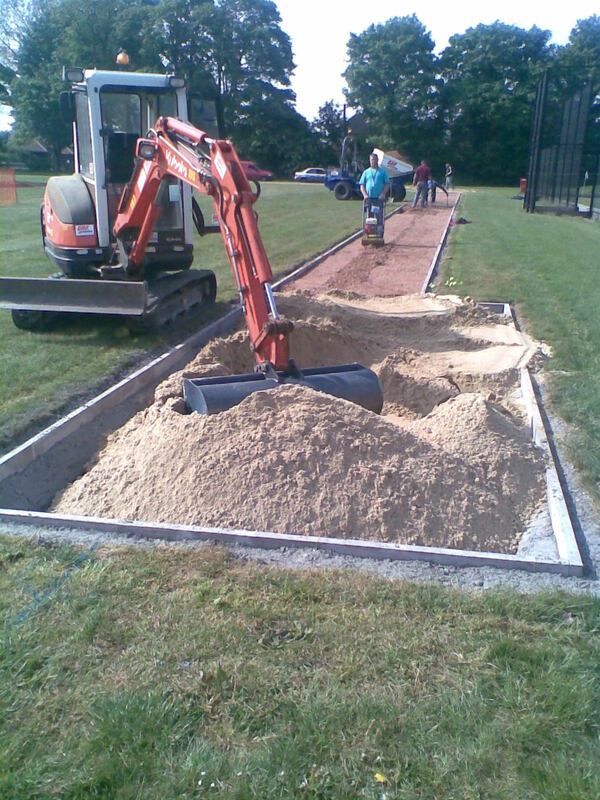 Long jump runways are the most common surfaces which are used at schools, these facilities can be installed in a range of different designs and area sizes. There are also a number of long jump facility funding opportunities available for schools throughout the UK. Sand Pit - The landing pit area is an important part of the full long-jump facility installation as it provides a safe surface for athletes to land on and gives accurate distance scores once the jump has been completed. Washed and dried silica sand is used in the landing pit and the area size may be altered to meet the requirements of each project. 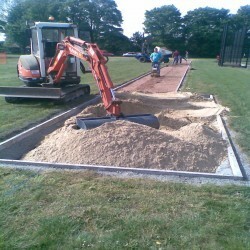 For more information on sand pits for long jumps please click here http://www.longjump.org.uk/sand-pit/ Rubber edgings can also be installed around the perimeter of the sand pit to enhance the safety qualities of the local acility. The installation starts with excavating the existing area and preparing the ground, a geotextile membrane is laid out to stop the growth of weeds and contaminations, and then the sub base is put down. The sub base for a polymeric long jump runway will include a layer of angular stones and then a layer of macadam. A needlepunch runway could have the same sub base system or it could just have the angular stones without the macadam. We will also install a long jump pit which is located at the end of the runway and provides athletes with a save place to land their jump. You may come across the AAA Sports Organisation when looking into the athletics sector; the AAA is known as Amateur Athletic Association. It is the original governing body for athletics and was around before UK Athletics. The group continues to exist to stand for the volunteer area of the sport but not to govern. Various academic institutions and also other organisations in Great Britain work together with the Amateur Athletic Association. This organisation offers open forums, setting up competitions which will help with the development of younger athletes. The AAA has produced these competitions in order to act as development tools for grass roots as well as to help youngsters to develop in the future. The AAA creates new track and field standards for various sports activities every year which is then submitted. These kinds of requirements depend on the results of past events and generate four unique grades that the greatest sports athletes get categorised into. The overall performance standards for the sports and athletics events are compiled by databases of information collected through the years and this is revised every two years. These standards are awarded to children with badges along with certificates. Plaques are also given out by the Amateur Athletic Association, to kids who achieve Grade 1 which improves the number or people who participate in athletics. Small grants or loans are available to young people looking to take up a career in athletics by the AAA Charity for the Young. In academic institutions these facilities are built to enhance the kids' running, jumping and also throwing, and even multiple activity participation into athletics. Running tracks, jumping run ups as well as discus circles are some favoured facilities that can be fitted. Multi activity areas can be achieved by setting up a single track; this can be used for long-jump, relay races, hurdles and many others. In both primary and secondary schools that cannot get a full sized track, this really makes a fantastic alternative which is much less expensive as well as takes up significantly less room. For more details on athletics please click here http://www.longjump.org.uk/athletics/ When someone completely enjoys performing a certain activity such as long-jump or discus, they are able to progress onto professional clubs inside the United Kingdom. There are not many facilities that target people at the beginners level, which makes young children unwilling to take part in athletics. It is very important for little ones to participate in sports at a young age - KS One and Two - and carry on through KS Three and KS Four. A new sports and athletics model has been produced by UKA, permitting small children to gain access to sports and athletics areas. The newest model could be constructed in vibrant colours to appeal to younger people and is also more cost effective, meaning it is a fantastic entry level sports facility for academic institutions. Considering that the specification and design of compact facilities could be altered, near enough any club or school can have one put in. A lot of establishments tend to get long jump runways in addition to high-jump fans put in within their compact facility. We're able to adjust size and dimensions of each construction to fit the available space on site. The flexibile design of compact sports and athletics facilities ensures that they are highly relevant to a variety of situations. To find out about athletic areas please visit this page http://www.longjump.org.uk/area/ For a lot of projects, existing sports and playgrounds could be developed in educational institutions to produce a far more diverse sporting provision. Children of every school key stages can benefit from personal growth when learning additional skills through the distinct sporting activities. More young people may be motivated to participate in the new sporting activities if they have a high quality and attractive facility readily available for them to use. For almost any nearby school looking to reduce costs and stick inside a spending budget, the compact recreational products present an amazing option. In terms of FUNdamental skills of athletics, a lot more kids are capable of leaning and practising jogging, jumping plus throwing through a range of activities. 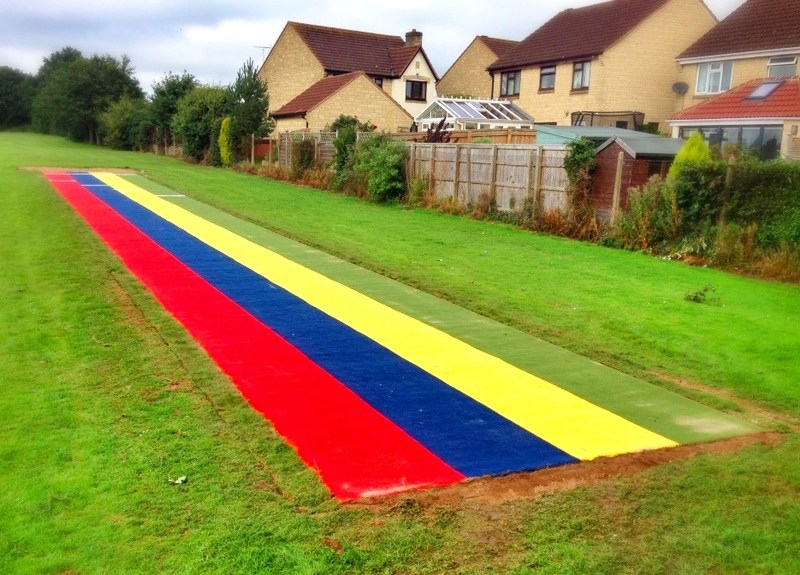 To find out more details about the long jump runway specifications and construction, as well as the funding opportunities available for schools please take a look around the rest of our website or feel free to contact us.